The Parisi Jump Start Program is taught by certified Parisi Performance Coaches and utilizes the most up-to-date research to build a young athlete’s physical foundation, improve their coordination and self-esteem. Our signature speed and strength training methods are serious, but all within a fun and friendly environment to ensure the young athlete is engaged and motivated to give 110%. In many of our locations, the Jump Start program is divided into Jump Start I for ages 7 – 10 and Jump Start II for ages 11 – 12. 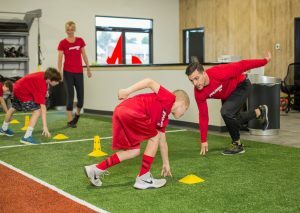 Regardless of the division, our Performance Coaches are specifically trained to motivate and challenge the young athlete, while providing age-level safe and appropriate training techniques and corrections that set a foundation for good life-time habits. Jump Start is a must for any young person who wants to develop foundational athletic skills that will help them rise above their competition. Speed is a learned skill, and Parisi Speed School is the place to learn!